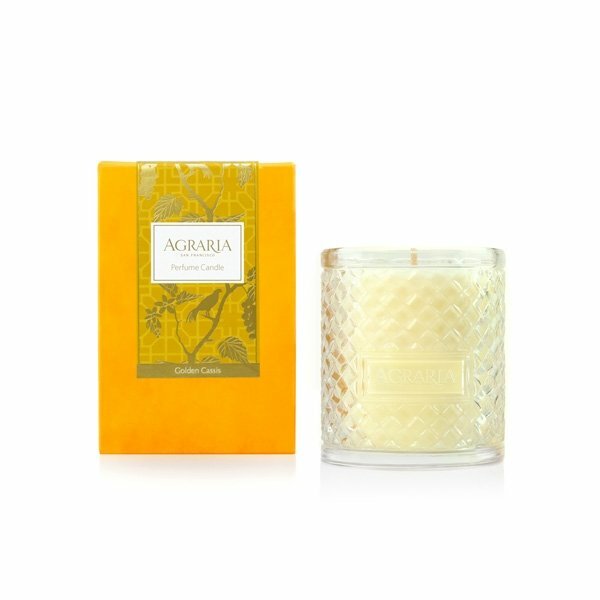 Agraria Golden Cassis Candle is fresh oranges and berries mingle with cassis, rose, jasmine and lily. Galbanum and sandalwood, warm amber and white musk drift through the background. Agraria Candles are presented in a modern interpretation of the distinctive, woven palm leaf cases known by Agraria fans. The intricate pattern accentuates the movement of the flame to create a luminous and mesmerizing glow. Also, after the candle has burned completely, save the decorative glass to keep makeup brushes organized, hold paperclips on your desk, or make mini flower arrangements as place settings for your next brunch.